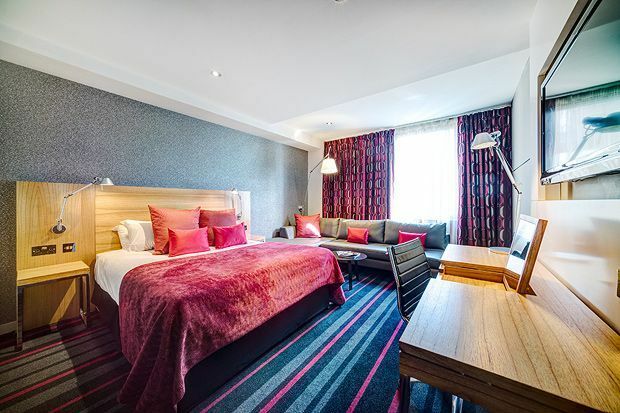 Located in the heart of Edinburgh s old Town, this contemporary four star deluxe hotel has 119 stylish and contemporary rooms, many with stunning panoramic views of Edinburgh Castle and the City skyline. Designed for comfort, the rooms include 42 widescreen LCD TV, large desk, Free WiFi internet and free local calls, ground coffee and selected tea, specially blended toiletries, iron and ironing board. Bathrooms have bath and/or separate walk-in shower. Hotel facilities include Agua Lounge Bar and Restaurant and guests can also enjoy complimentary use of the leisure facilities, located a few doors away at the Apex International Hotel.